Many patterned papers are great for creating your own borders for your scrapbooking pages. On this layout I have used a floral paper to create a border across the bottom of my page and balanced it with a thinner border made of a striped paper across the top of the page. This layout was created using Three Bugs In A Rug Rapture Rhapsody Paper, Three Bugs In A Rug Frenzy Rhapsody Paper, Three Bugs In A Rug Stripe Rhapsody Paper, chocolate brown Bazzill cardstock, purple cardstock, pink cardstock, 5 chocolate brown brads, 4 cream brads, pink ink, dark brown ink, pink alphabet stickers and Pebbles Inc Make A Wish Alphabet stickers. Use the chocolate brown Bazzill cardstock as the background. Cut a piece of Three Bugs In A Rug Rapture Rhapsody Paper measuring approximately 27cm by 27.3cm. Adhere to your background approximately 1.8cm from the right of the page and 0.7cm from the bottom of the page. Cut out a floral border from the Three Bugs In A Rug Frenzy Rhapsody Paper, as seen in the layout above. Ink the edges with pink ink. When dry, lightly ink the edges again, but this time with dark brown ink to help it stand out. Once dry, adhere across the bottom of the page approximately 1.5cm from the bottom edge. Place a chocolate brown brad in the centre of each flower. Cut a strip of Three Bugs In A Rug Stripe Rhapsody Paper measuring approximately 27cm by 1.2cm. Adhere it across the top of your piece of Rapture paper, approximately 0.8cm from the top edge of the Rapture paper. Mat both your photos with purple cardstock. Position as shown on the layout above and adhere. Select the alphabet stickers you are going to use for your title. 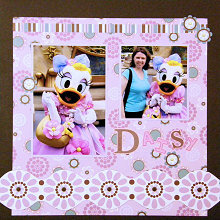 Mat each one with pink cardstock and adhere underneath your small photo. Cut out four small green flowers from Three Bugs In A Rug Frenzy Rhapsody Paper. Adhere two towards the top right corner of your page, as shown in the layout above. Adhere another on the left side of your large photo and the last one below your title. Finally, attach a cream brad to the centre of each of these flowers.